Like the ghost of Christmas past, leftovers from rich holiday meals have a habit of malingering in the fridge awaiting an inspiration that is progressively less likely to arrive as the holiday season fades into memory, especially in the broadening context of one’s waistline, try as one might to conceal it beneath this year’s hideous knitwear gift from Aunt Hilda. In our household, it is usually around the second week of January that we finally face up to the fact that no one is going anywhere near what’s left of the nut loaf. We’ve noted before that there are some cases in which an abundance of aging leftovers is a blessing, but on the whole, time is of the essence if you’re to take advantage of remnant holiday provisions before they become too superannuated or resolutions to eat sparingly actually kick-in. Even so, the conventional answer is to try to fashion something that is as unlike the original as possible to distract the weary palate from recognizing the recycled goods. In prior years, this has manifested itself in a revolting “Cajun-spiced” turkey as well as a doomed attempt at “Mexican” mole using ham, gravy and green beans that succeeded only in convincing the diner to retch. However, if you have a fridge full of leftovers, fear not, as enticing confections can be raised from the ashes of Christmas dinner, especially from the dessert course. In many Italian and Italian-American households, the sweet egg and fruit bread, panettone, is a common sight on the holiday table. And, it is just as commonly left, largely untouched, come the New Year as stomachs bloated on lasagna, seven fishes or roasted meats repeatedly balk at dessert. This year we were fortunate enough to have been sent a pair of panettone – one traditional, one featuring chocolate chips – from Bauducco, that we tried but failed to find room for during our Christmas dinner. Happily, inspiration struck almost immediately, and with a bottle of marsala, some mixed berries, a packet of rasperry jello and some English custard powder to hand, we fashioned a confection so cunning that nary a private detective with the nose of a bloodhound could have perceived the recycling it concealed. In the UK, there is no dessert so traditional, perhaps save the Christmas cake with its rock-hard icing or the figgy pudding speckled with filling-threatening “lucky” coins, especially on Boxing Day, as the Christmas trifle. Served chilled and conventionally made with lady finger cakes soaked in sherry and topped in layers with jello(y), custard and whipped cream, it is considered an almost ethereal cousin to its dense, fruit n’nut dessert counterparts. Light, though not in calorific value, it offers an unusual pairing of flavors, which along with wobbly mouth-feel provides a pleasant contrast to the heavier dishes of the season, providing one doesn’t make the mental leap to those involuntarily trembling anatomical sections you’ve been augmenting this past fortnight. Hailing originally from Milan, panettone is today the quintessential Italian Christmas bread and is taken with coffee and a variety of liqueurs throughout the holiday period. However, its origins are by no means ancient, having only really gained popularity since the turn of the 20th century, but its advent coincided with both Italy’s unification and the period of mass Italian emigration to the New World in such a way that panettone’s presence is almost ubiquitous on South American Christmas tables especially Argentina, Brazil and Chile. A Brazilian company based in Sao Paulo and still owned by descendants of its Italian-immigrant founder, Bauducco has been making panettone and almost nothing else for more than 60 years, recently launching its products in the US from a factory near Miami. 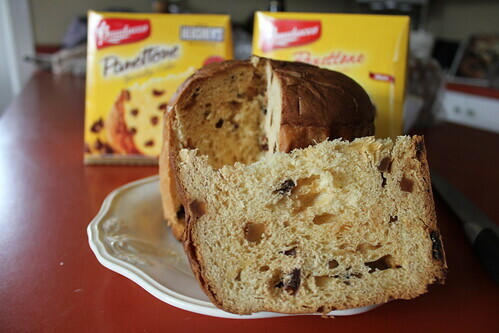 Light, eggy and sweet, Bauducco’s panettone is slightly more saccharine than Italian panettone and lacks some of the dried fruit and holiday spice flavors that is common with more traditional purveyors. For this reason, it made the perfect base for a trifle, but may fail to please the purists. Nonetheless, because of these characteristics and its brioche-like consistency, it is a perfect weekend breakfast food at any time of the year when paired with a bracing jolt of espresso. And, if the tastes of a two year old are any indication of gastronomic value or interest to our readers, you may wish to know that our son thoroughly enjoyed it and currently prefers panettone to cookies. It’s also worth knowing that panettone is meant to last a while, and if kept in an airtight container, it will be good for several months, so you shouldn’t worry too much if you either have plenty leftover or you find it on the discount shelf at your local market. Indeed, the English Christmas trifle isn’t wildly dissimilar to the English summer trifle, the principal difference being the type of fruit included, so if you don’t get around to it until the weather is edging towards mild again, this recipe will still be good. Quantity of hot water according to instructions on gelatin package. In a large, high-sided glass bowl, overlap the panettone pieces until all are in place. Depending on the size of your bowl this will give you a layer of panettone two or three inches deep. Pour the Marsala over the panettone so that it’s evenly distributed and begins to soak in. After washing the berries, mix them and place them on top of the panettone. Following the instructions on the package, make the jello, and immediately pour it over the panettone and fruit. Place dish in the refrigerator until jello is set, about half an hour. When jello is set, remove dish from fridge and, following instructions on the package and 1 pint of milk, make 1 pint of custard. Carefully spoon or pour custard over jello until you have an inch or more layer atop the bright red jello. Return to fridge and allow to set, about half an hour. While custard is setting, whip double cream by hand, and when custard is set spoon or pipe the whipped cream until you have another inch or deeper layer. 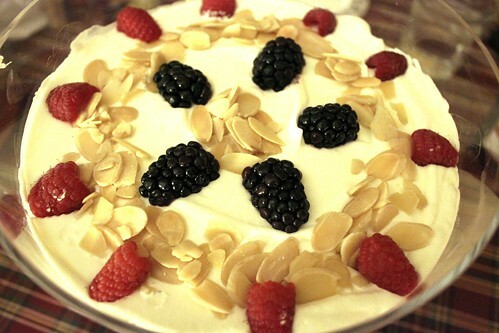 Depending on when you plan to serve the trifle, you should wait until immediately prior to serving to top the trifle with berries and slivered almonds or the fruit will stain the cream. Serve with glasses of the same Marsala or sherry. Good idea. I’m Italian, so panettone is always a must at holiday meals. But there’s always so much left over (because, of course, people bring other desserts). This seems like a nice way to use it up. Thanks for the recipe. @Roberta: thanks for visiting and your comment. People do always bring desserts, don’t they? It’s either cookies, chocolates or desserts. Why don’t people bring dessert wines? 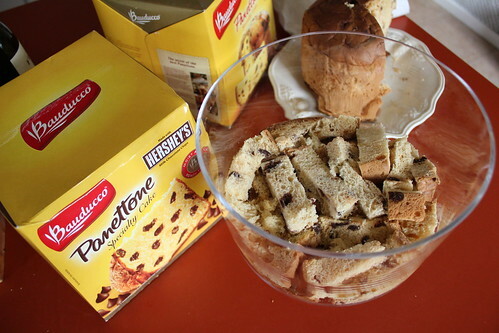 Panettone is a great idea for a trifle, will try that next time someone gives me one. Birds custard I can just about condone in a trifle, although I prefer a real egg custard, but JELLO? 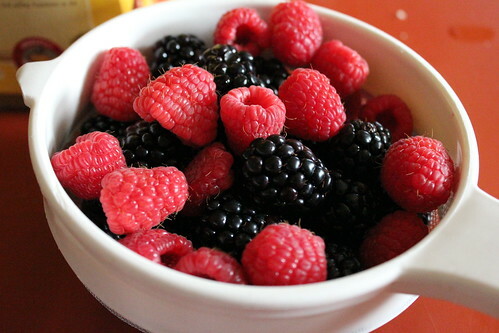 Think I’d skip that bit, but then I’m a trifle obsessive….Love your blog. @Tamsin: what? no jelly in your trifle? just ladyfingers, custard and cream? I’ve never heard of such a thing. It’s probably much more refined and less,well, childish, than with jelly, but the coloring is all a bit the same, no? And, agreed, a homemade creme anglaise with real vanilla is vastly superior, but Bird’s has been good enough for generations in my family, so it constitutes part of the traditional recipe. Thanks for visiting and making your first comment! Hope you’ll be back again soon. I have a horrible admission to make. I have often gotten pannetone and let it dry out only to be thrown out. Too big for the freezer or fridge, it sat in it’s pretty box with a slice or 2 gone and then went in the garbage. 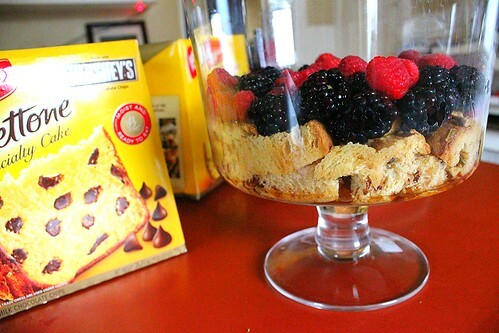 What a great idea to use it in a trifle. Bravo. 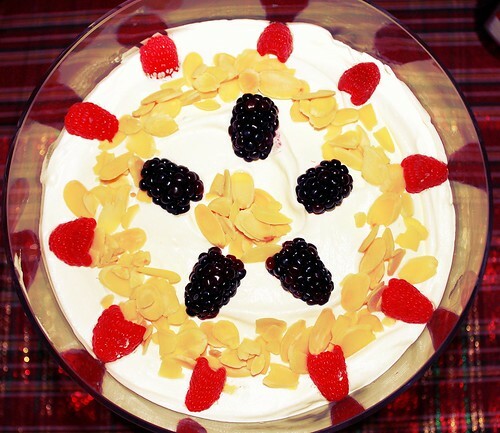 @Deana: my mother always said that she’d rather be fat than waste food, but even while sharing that belief, we’d have had to make at least three trifles to use both panettones, and I don’t think any of us wants to save food enough to eat that many! Yum. I love trifle. Check out the food blog I have just started http://www.surreyKitchen for some other Christmas left over recipes. Thanks!